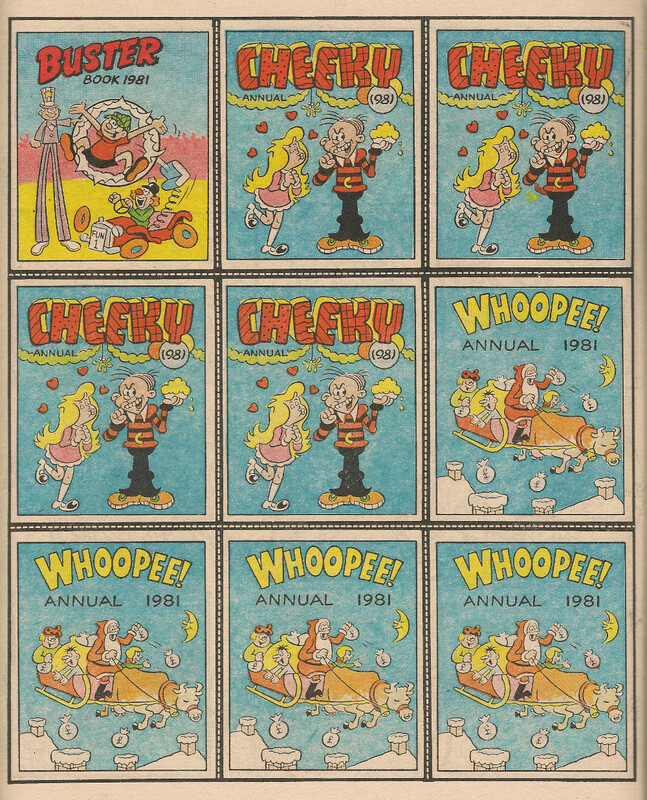 Next up in my examination of the 1981 festive escapades of those characters from Cheeky Weekly who continued to appear in Whoopee! is Paddywack. I like Jack Clayton's depiction of the laughing party guests in the final panel. The remaining survivors from Cheeky Weekly at this point were Charlie Counter and his battery-powered buddy, Calc. 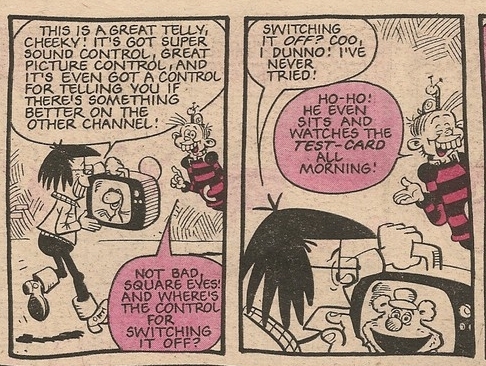 UK television viewers in 1981 had a choice of three channels (Channel 4 would launch in November 1982), most homes had only one TV and less than one in ten households had a video recorder. 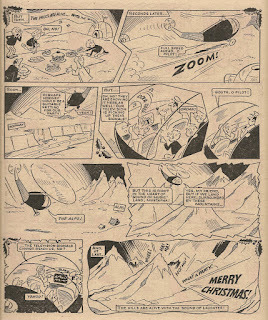 Thus the Christmas day televisual dilemma looming chez Counter was a familiar one to comic readers of the time. 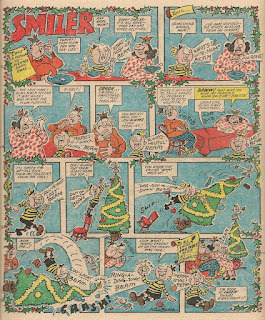 I found this to be a rather sad ending as the Counter family withdrew to separate rooms on Christmas evening, but no doubt they all gathered again once their respective programmes had finished. Terry Bave furnishes his customary Christmas embellishments. 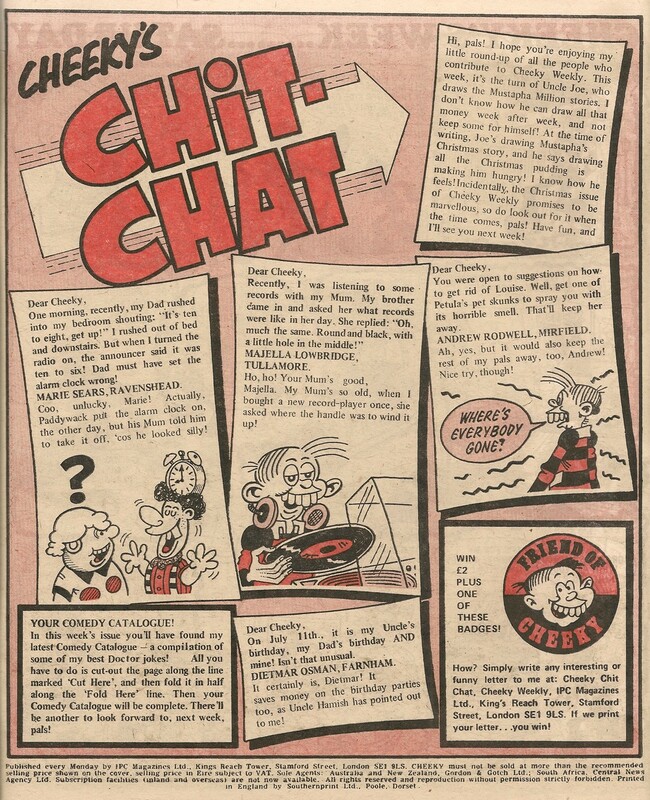 Always good to see Charlie's dad's extraordinary moustache. 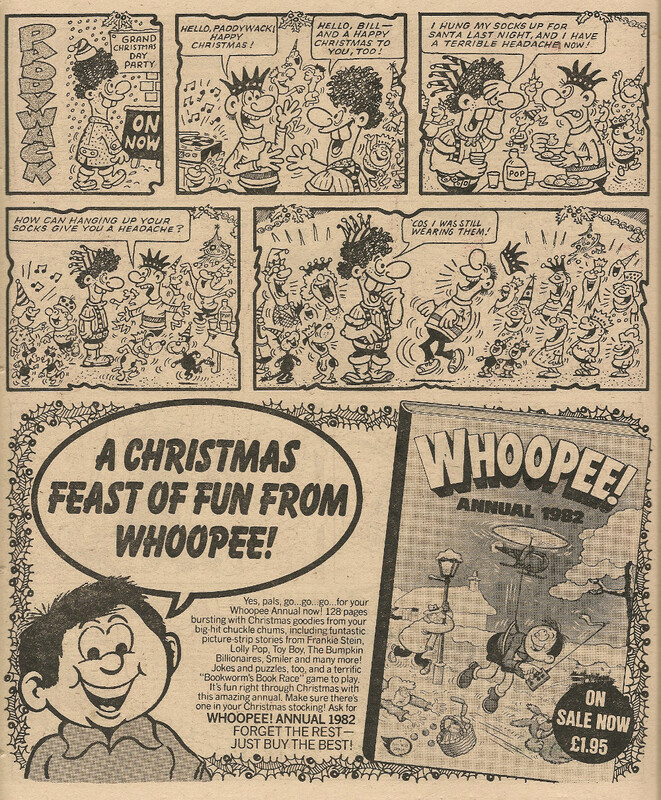 If I may, I'll close this look back at the Christmas 1981 edition of Whoopee! 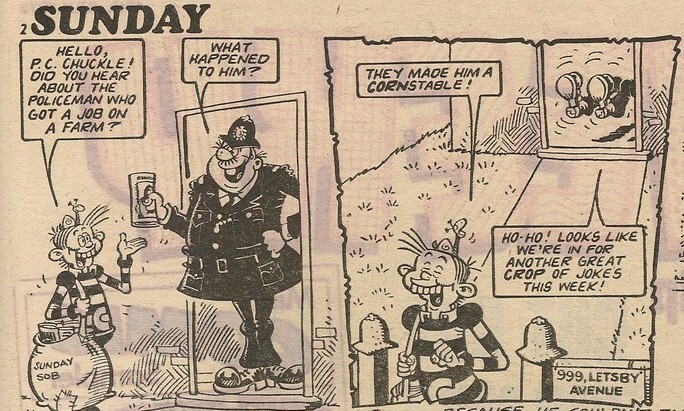 with a couple of non-Cheeky related strips. 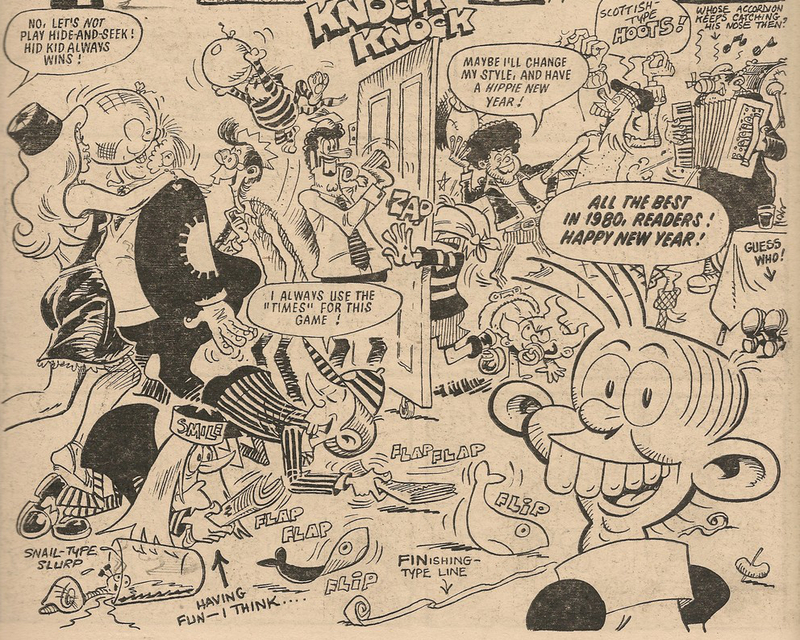 Actually, the first does in fact have a link to the toothy funster, since it's drawn by the mighty Frank McDiarmid. 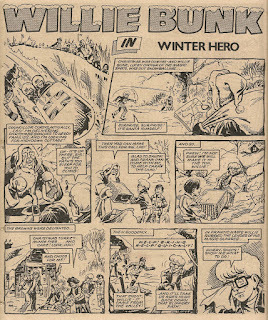 The Spectacular Adventures of Willie Bunk first appeared (as far as I know but see my observation later) in the debut issue of Whizzer and Chips in 1969, drawn by Frank. 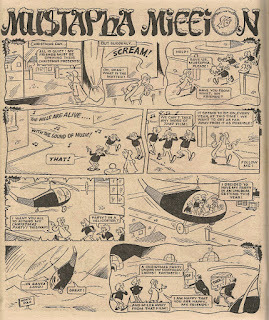 You can see that strip on Peter Gray's blog. 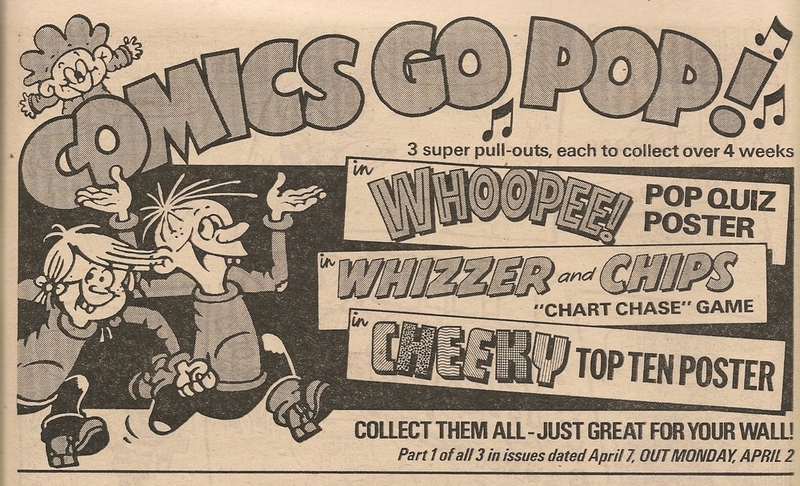 To me, it seems that there's evidence of re-sizing of artwork on those Whizzer and Chips pages, so I'm wondering if that strip was in fact a reprint. Anyway, Wikipedia tells us that Willie's Whizzer and Chips adventures ended in that comic's 26 December 1970 issue. 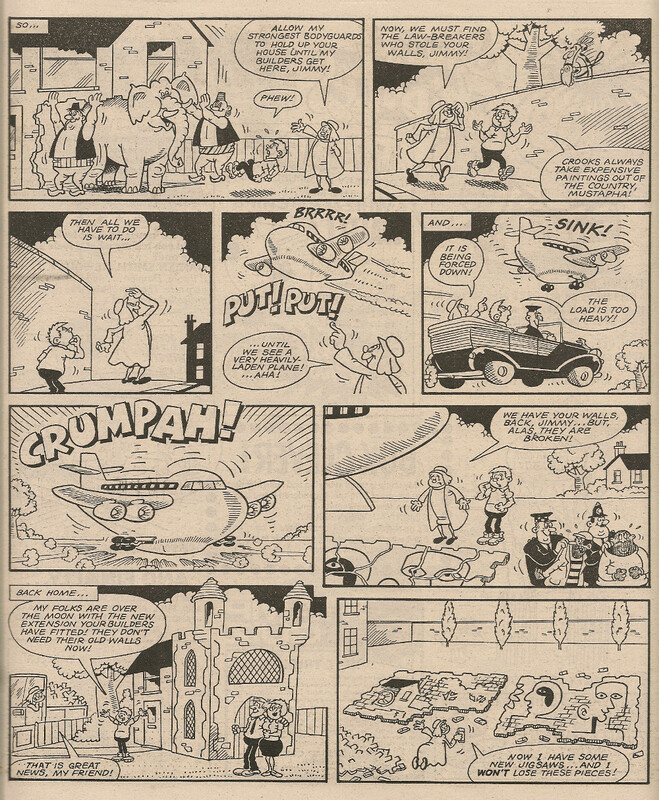 However, Frank brought Willie out of retirement to begin a new run of adventures in Whoopee! 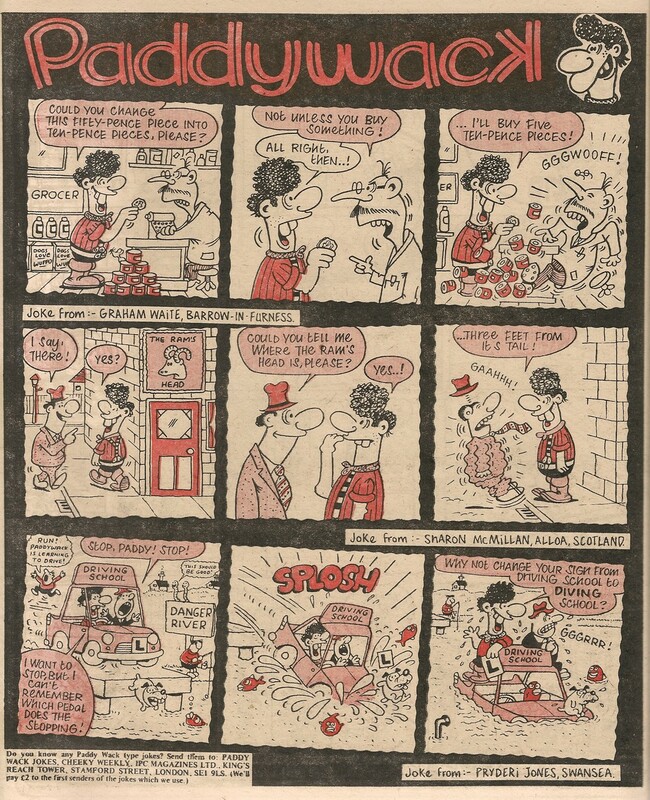 dated 12 September 1981, and Peter posted the first of that new series here. 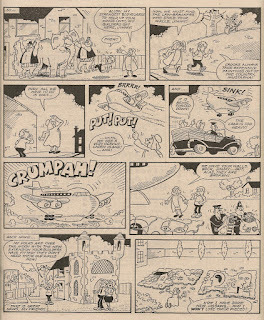 Frank's less cartoony style in evidence here works very well with this kind of story. 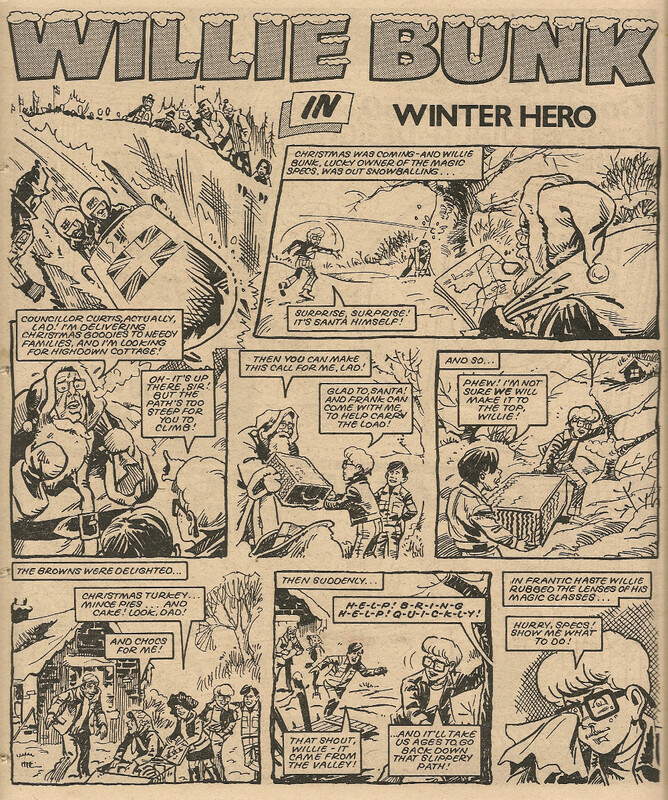 As Peter mentions on his blog, the Bunk strips made use of spot colour to denote the fantasy sequences where readers shared the world that young Willie was experiencing through his glasses. Coincidentally, Lew Stringer recently posted a similar 'owner of enchanted eyewear' character's Christmas episode, namely Billy Binns and his Wonderful Specs, from Boys World in 1963. 'Bins' is of course slang for spectacles; I've seen speculation that it's short for binoculars, or that it's Cockney rhyming slang based on the phrase 'bins and receptacles' which I can only imagine was a term used in relation to refuse collections in days gone by. I hope your Christmas and New Year are suffused with 'beams'. 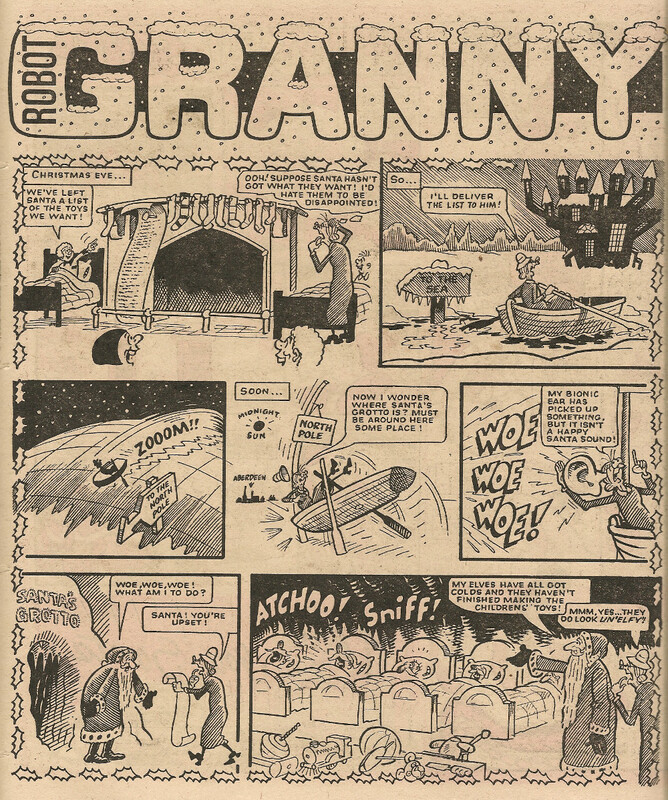 Gran's abilities suit her to the oft-used 'Helping Santa out of Trouble' plot. 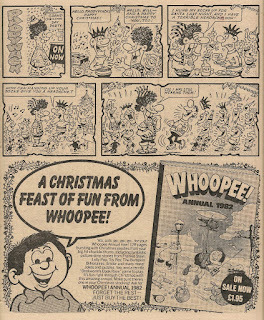 This third installment of my look through the Christmas 1981 issue of Whoopee! in order to observe the seasonal adventures of our Cheeky Weekly pals who had survived the cancellation of their comic brings us to page 13's Christmas Quiz Time, a workout for Xmas-pud-addled brains that featured the toothy funster and his chums (including Paddywack who was for some reason absent from the cover of that festive edition). I have already posted about this page, so I'll direct you here for the full info. 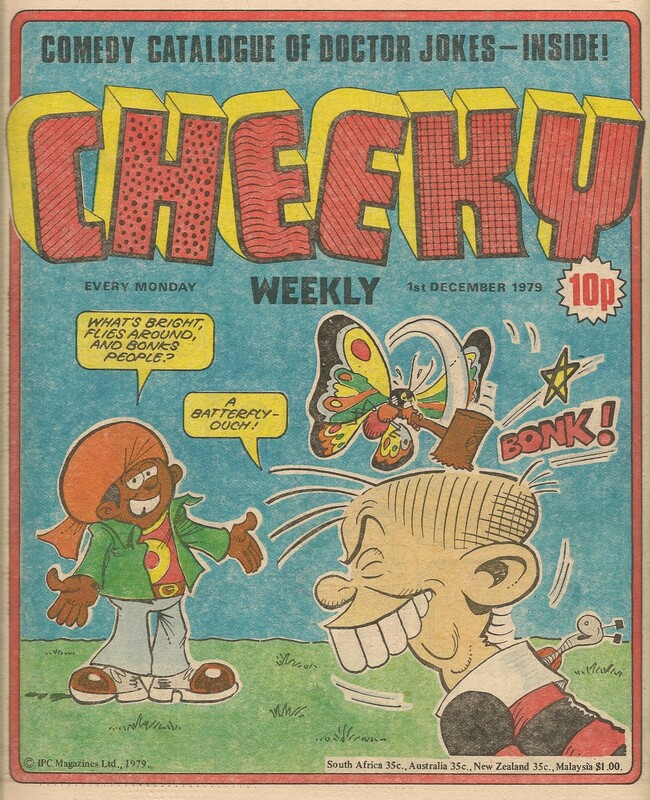 Next up is Cheeky himself, now in somewhat reduced circumstances. 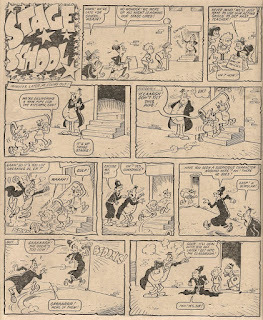 Once he was the star of his own comic, and had begun his Whoopee! 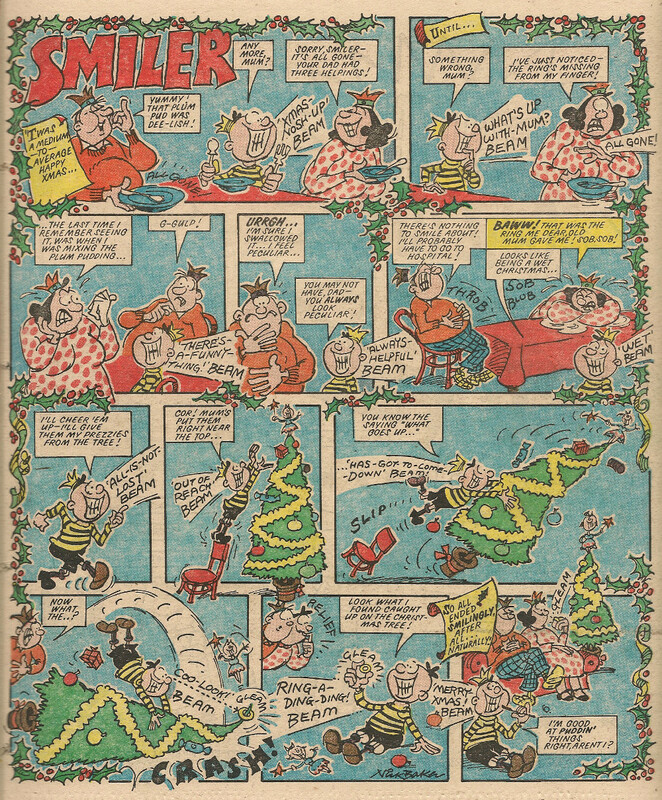 run with 4 pages a week, but Christmas '81 finds our grinning pal confined to a 2-page centre spread, and even then he has to share it with strips featuring his slimy sidekick and a bearded, jolly fellow who gets very busy at the end of December. 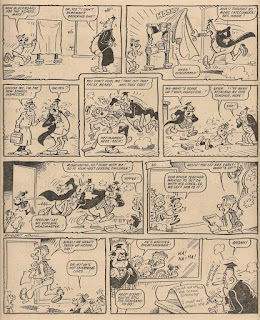 Nevertheless Frank McDiarmid packs the space with a welter of Yuletide gags, as Cheeky meets a good number of his Krazy Town pals. 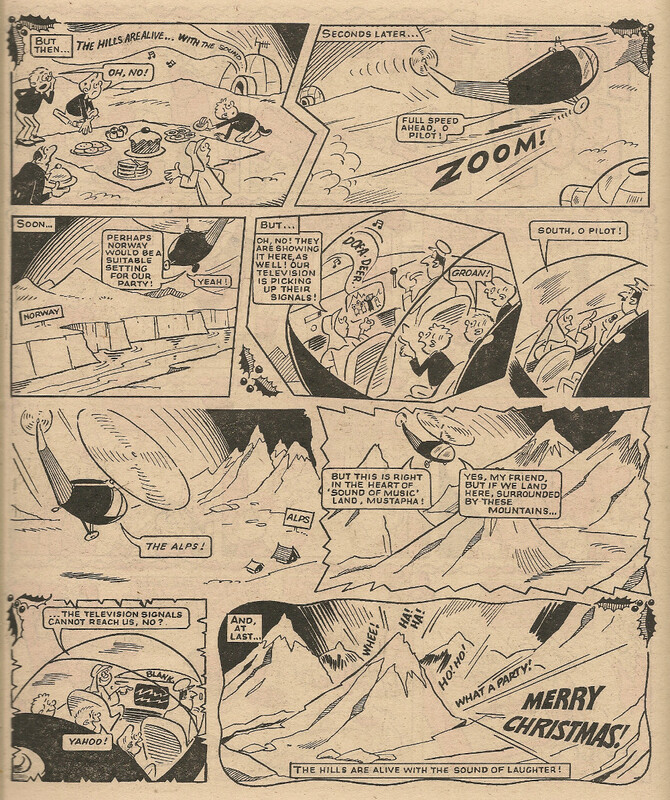 Sadly there's no slap-up feed but the feature concludes with a nice sentiment courtesy of the man with the sleigh and reindeer. I always feel a bit cheated if a Christmas story doesn't end with a slap-up feed, and Robert Nixon (who does some great seasonal border work) furnishes a sizeable festive nosh-up, complete with steaming turkey. The Christmas truce ending is suitably heartwarming. Another look back to Christmas '81 coming soon. 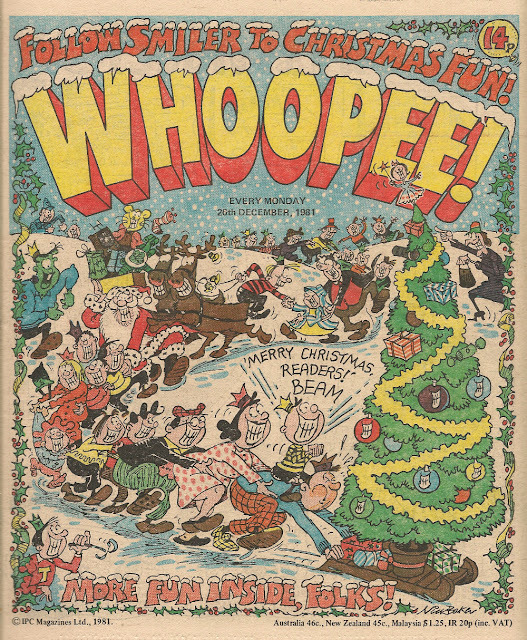 This issue of Whoopee!, the Christmas 1981 edition despite its Boxing Day cover date, features a Yuletastic cover by the great Nick Baker. 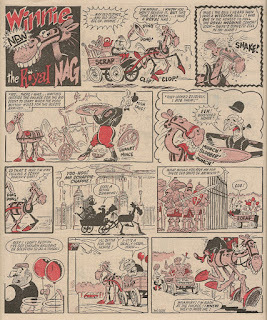 Nick, who's probably most well known for drawing the ever-grinning little lad Smiler, endows the entire Whoopee! 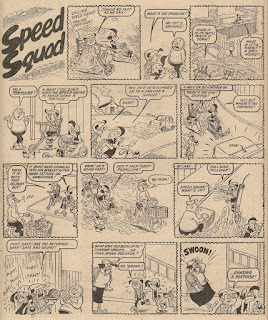 line-up of fun pals with Smiler-like 'beams' (well, apart from Frankie Stein). Mercifully, we are spared the full horror of Cheeky, whose gob could hardly accommodate a more fearsome set of gnashers than his own, with a mouthful of Smiler-alike dinner manglers, since the toothy funster is only seen in profile. 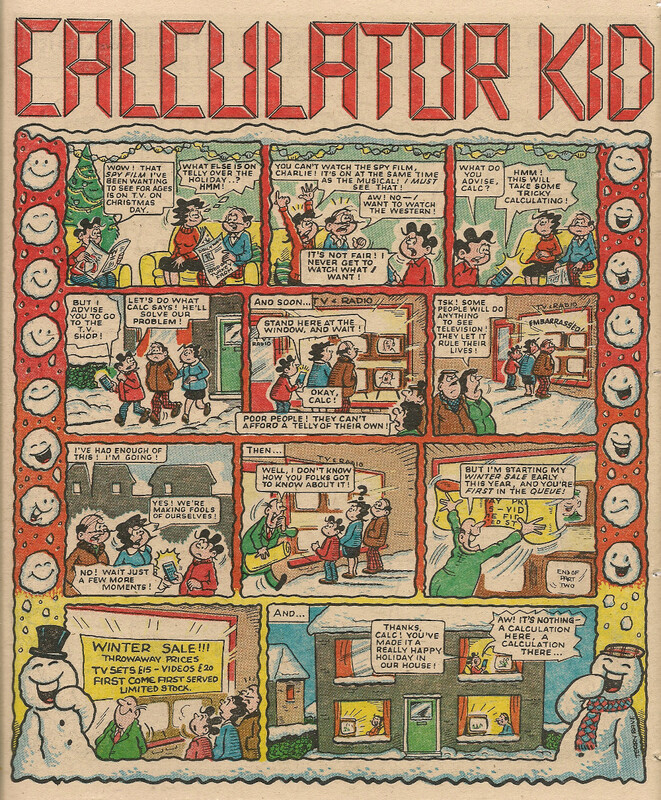 However, Calculator Kid, Mustapha Million, Teacher and kids from Stage School and 6 Million Dollar Gran (survivors all from Cheeky Weekly which merged into Whoopee! 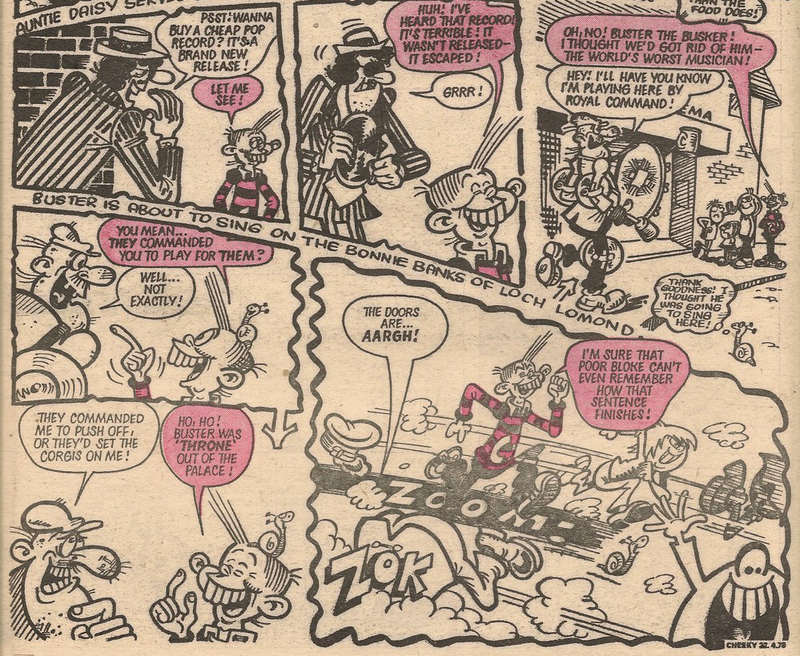 when the toothy funster's comic ceased publication in February 1980) all get a dental upgrade. Not seen on this cover is Paddywack, the other Cheeky Weekly survivor who continued to appear in Whoopee! at this stage. Pity we don't get to see a slap-up feed at the end. 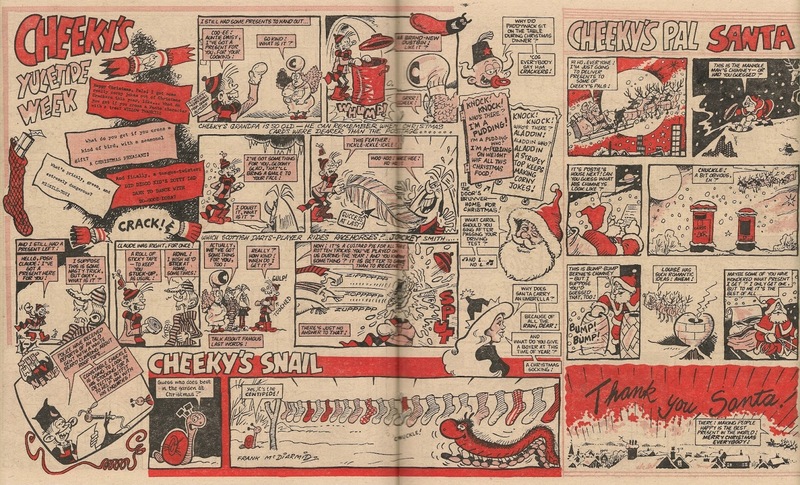 I'll be examining the 1981 festive doings of our other Cheeky Weekly pals soon. Before the rise in television ownership began to dent cinema attendances, it was common to see street performers attempting to entertain queues of eager film fans as they waited for the picturehouse to open. These musicians/dancers/escapologists etc would of course be hoping to raise cash from their captive audience. Krazy Town’s busker, Buster, was often seen performing to the queue of kids waiting to stampede over the Commissionaire and into the Saturday morning picture show, but his less-than-harmonious one-man-band stylings were never seen to result in donations. 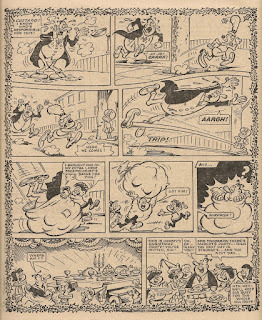 The 03 December 1977 issue was the only edition in which Buster had two separate encounters with Cheeky – the first being in the usual pre-film show sequence, but the second occurring as Cheeky left the cinema after watching the programme. 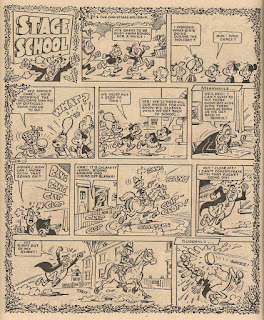 This 3-panel strip was constructed from images originally seen when Buster made his debut in issue 1 (above). 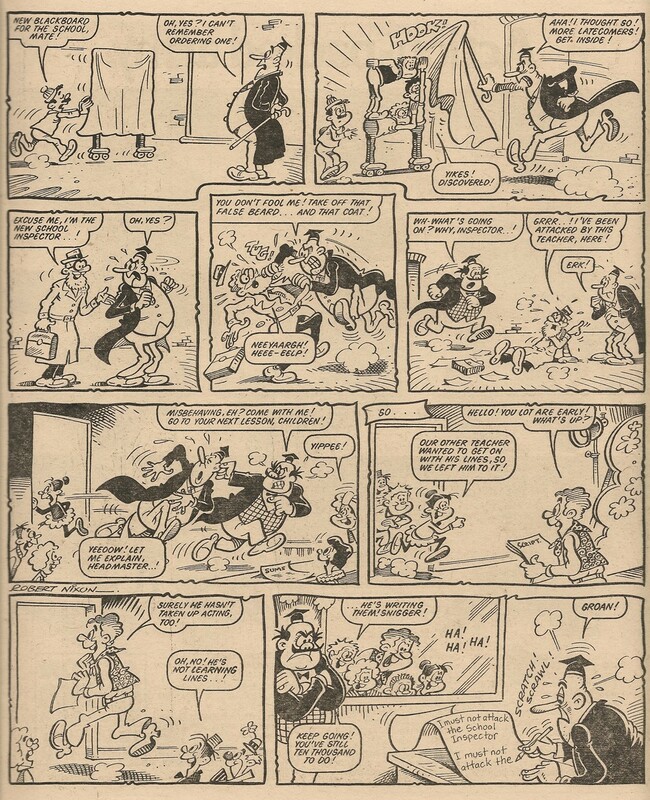 Buster was then absent from the comic until the 05 January 1980 edition where he was seen (or WAS he?) on Monday at Cheeky’s new year party. My original thought regarding the long gap between Buster's 09 December 1978 and 05 January 1980 appearances was that the January 1980 artwork was drawn a year earlier when Buster would still have been fresh in readers’ memories, but was not used at that time due to the industrial dispute which caused the comic to suspend publication for 3 weeks in December 1978. 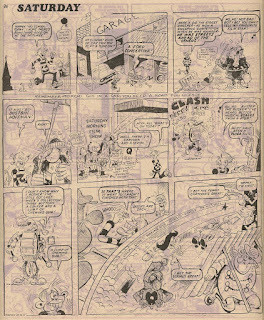 However, this is clearly not the case as Cheeky's new year 1979 party was depicted in the 13 January 1979 comic. 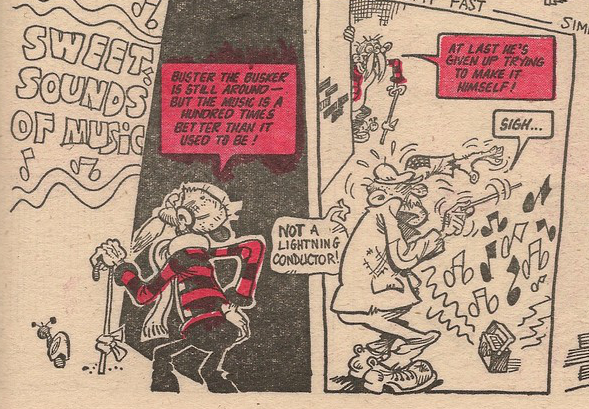 This makes me wonder whether the one-man-band shown at Cheeky's 1980 Hogmanay bash was indeed Buster with his bass drum moved to his back to accommodate the accordion, or in fact a musician hired by Cheeky's parents. 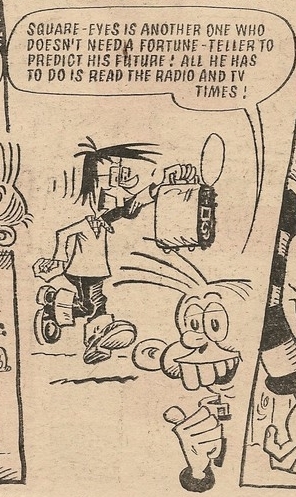 The fact that the partygoers seem to be enjoying the music (the way that Disco Kid is seriously getting down indicates some damn funky accordion) suggests that it isn't Buster. 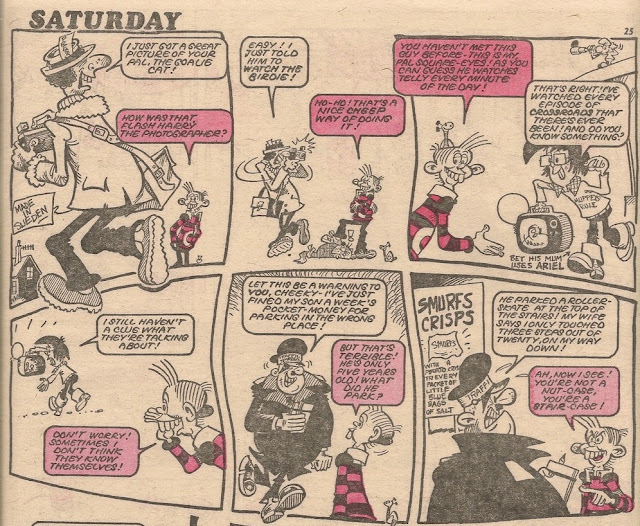 Discounting the above as being a performance by Buster means that the incompetent instrumentalist appeared in a total of 32 editions of Cheeky Weekly. 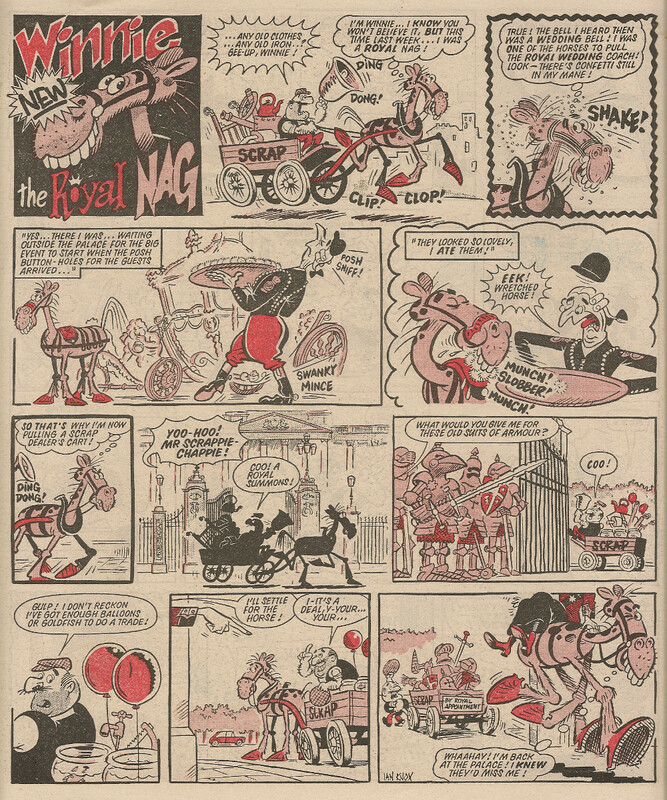 The terrible tunesmith was featured on the Pin-Up Pal poster in Cheeky Weekly dated 25 March 1978. 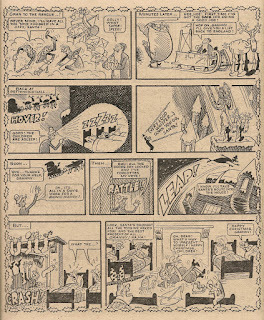 Since the Saturday morning picture show sequence was never depicted in Cheeky’s strips in Krazy, it’s no surprise that Buster never appeared in that comic. 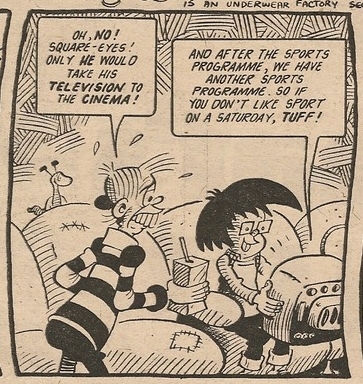 The phrase, coined in the early years of TV, “You'll get square eyes if you stare at that telly much longer...”, was uttered by parents in vain attempts to dislodge their cathode-ray tube-obsessed offspring from the sofa where they sat entranced by Tiswas, Doctor Who, the test card and just about anything that emerged from the flickering 405-or-625 lined box in the corner. 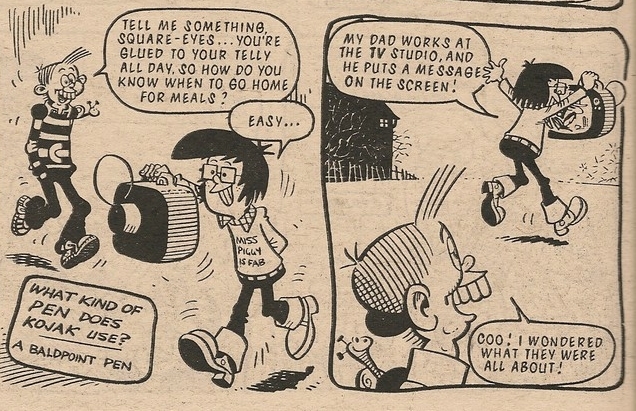 Thus was named Square-Eyes, Cheeky Weekly's box-goggler, who made his debut in issue number 47. So enamoured was he of the small screen that a portable telly was in his grasp at all times. 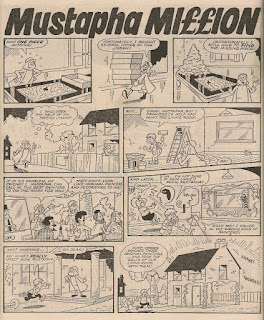 Such an item was, in the late 1970s when most houses had only a single TV around which the whole family would gather at peak viewing times, something that most Cheeky Weekly readers could only dream of possessing. 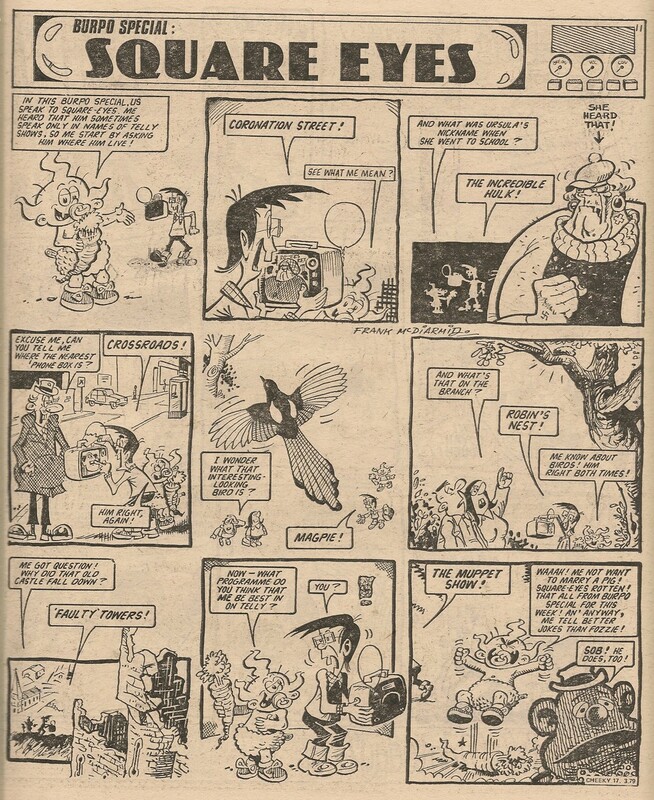 Square-Eyes made it to Cheeky Weekly's cover in the second week of the Friends of Cheeky Snap Game (13 January 1979). 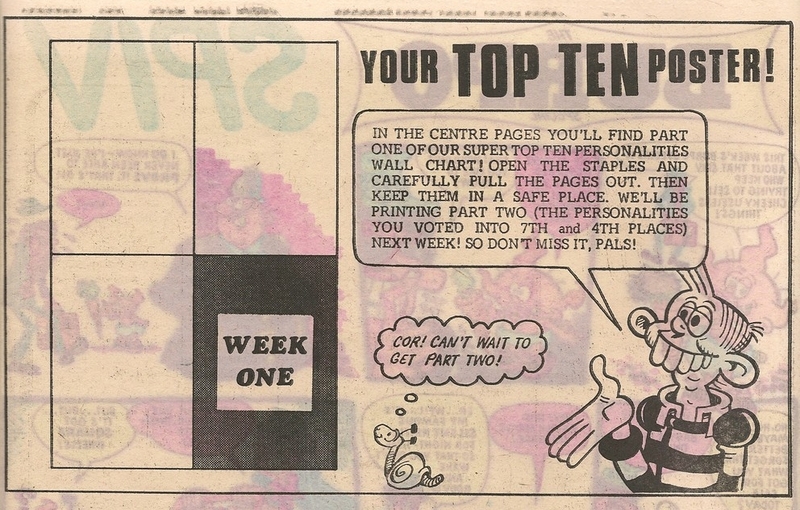 The juvenile TV addict was one of the characters featured on the cut-out cards, and one such card was included on the front page to promote the game. 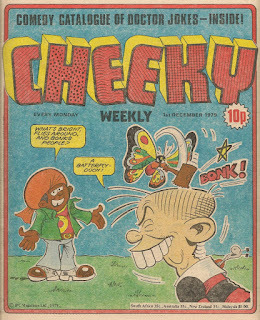 The same image of Cheeky's TV-loving chum featured on the Pin-Up Pal poster included in the 17 February 1979 issue. 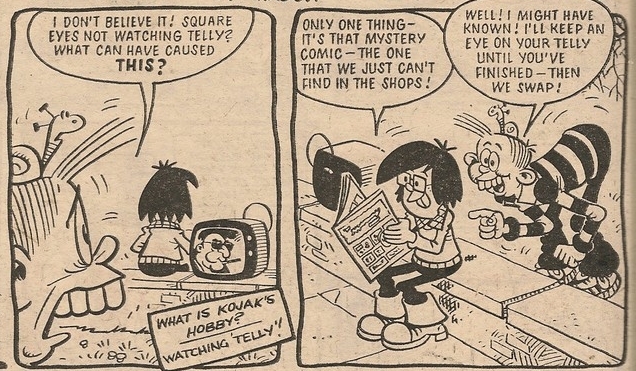 Square-Eyes' final Cheeky Weekly appearance was in the issue dated 19 January 1980, the 34th issue in which Krazy Town's telly addict had appeared, and just 2 issues short of the final edition. 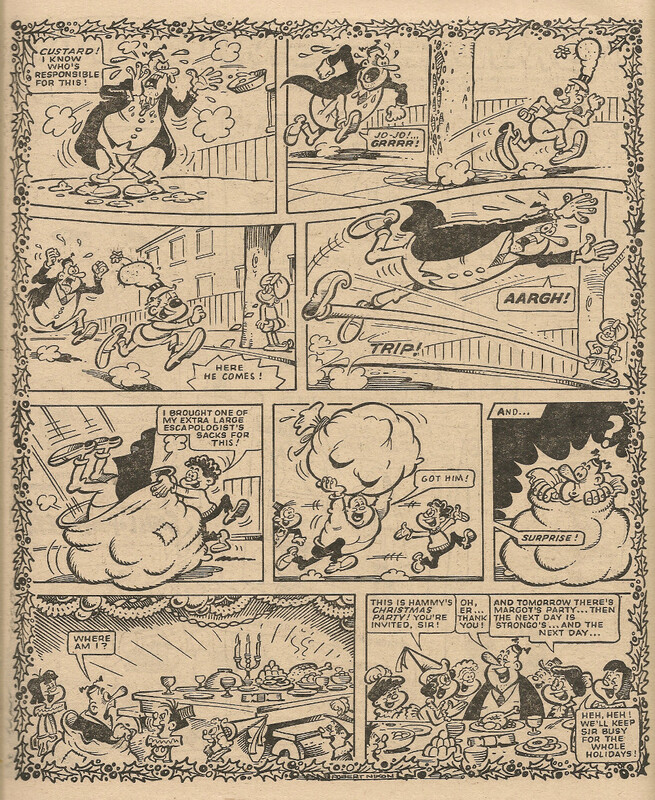 As time went on, Frank McDiarmid's renditions of Square-Eyes emphasised the telly-watcher's front teeth, and facially he came to resemble Krazy Town's feeble fitness fanatic, Jogging Jeremy (aside from Jeremy's lolling tongue). Jogging Jeremy from the same issue as above. 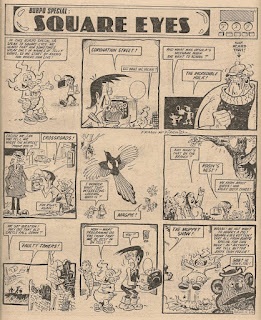 Square-Eyes was created for Cheeky Weekly and never appeared in Krazy. 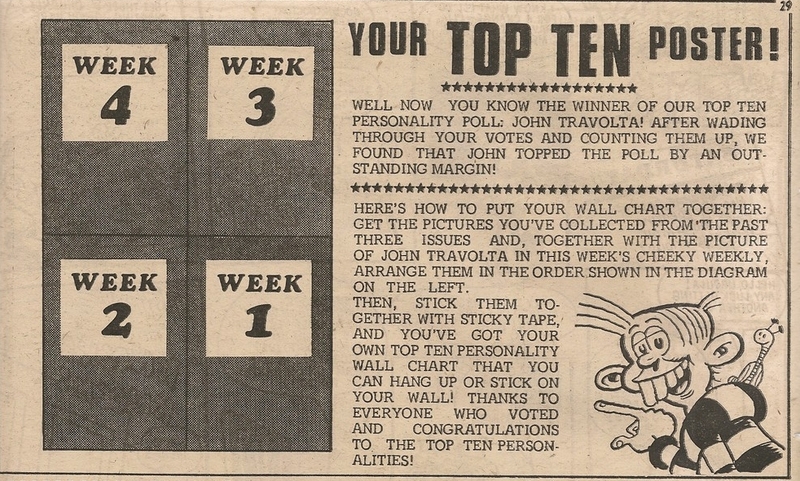 Front-runner John Travolta was at the time cresting a wave of UK popularity following his Saturday Night Fever (1977) and Grease (1978) film roles, as well as featuring with his Grease co-star, the third-placed Olivia Newton-John, on the hit single from the latter movie, You're the One That I Want, which topped the UK singles chart for 9 weeks in summer 1978. Second-placed Roger Moore (later Sir Roger) was of course the then-current James Bond, his most recent suave outing as 007 at that time being 1977's The Spy Who Loved Me. In fourth place was Henry Winkler, who portrayed Arthur Fonzarelli in American nostalgia-com TV show, Happy Days, an import that was very popular with UK viewers. 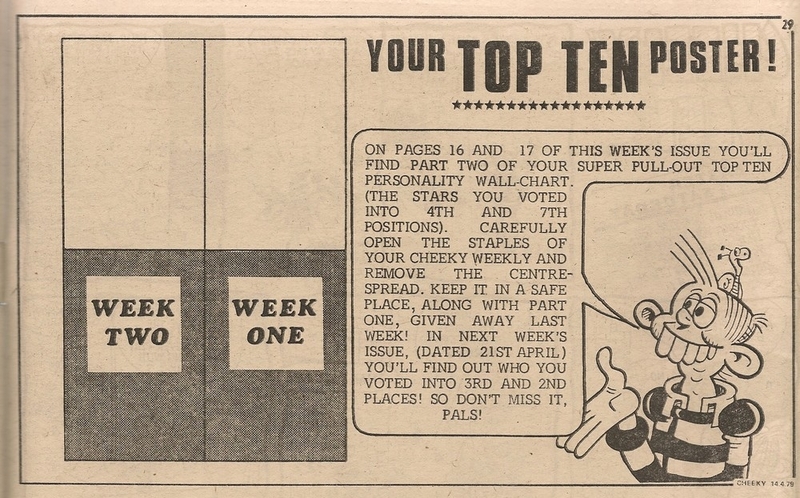 The above announcement appeared again in the 10 and 17 February editions of Cheeky Weekly, and either the votes received in the intervening period maintained the relative positions of the 4 celebrities or else no further counts had been undertaken, as the placings remained the same as they had been when the announcement first appeared. 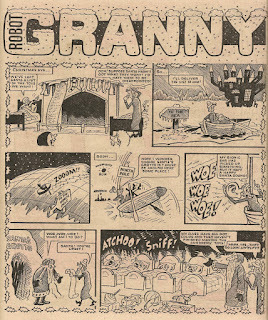 Cheeky Weekly dated 31 March 1979 included the above ad, trailing the commencement of a promotion the following week that would encompass companion titles Whoopee! 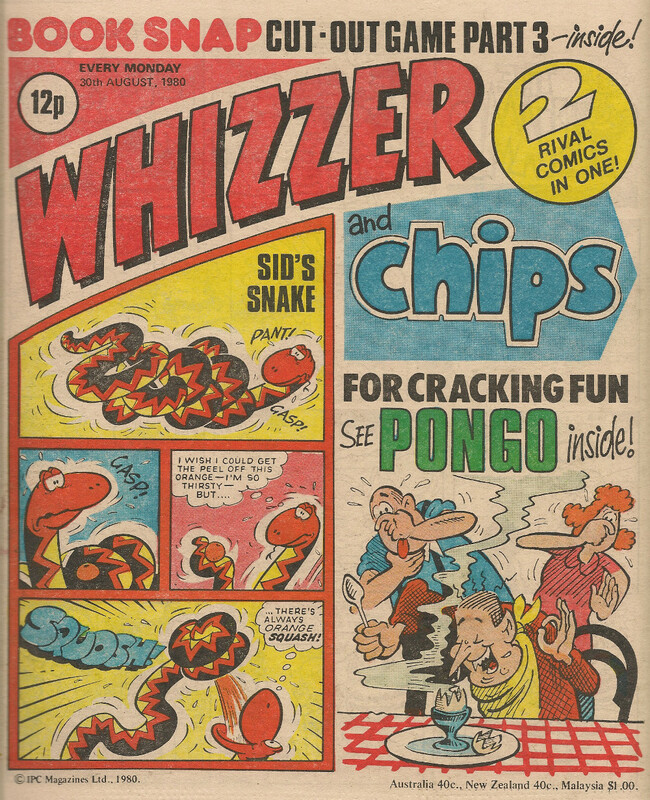 and Whizzer and Chips as well as the toothy funster's own comic. 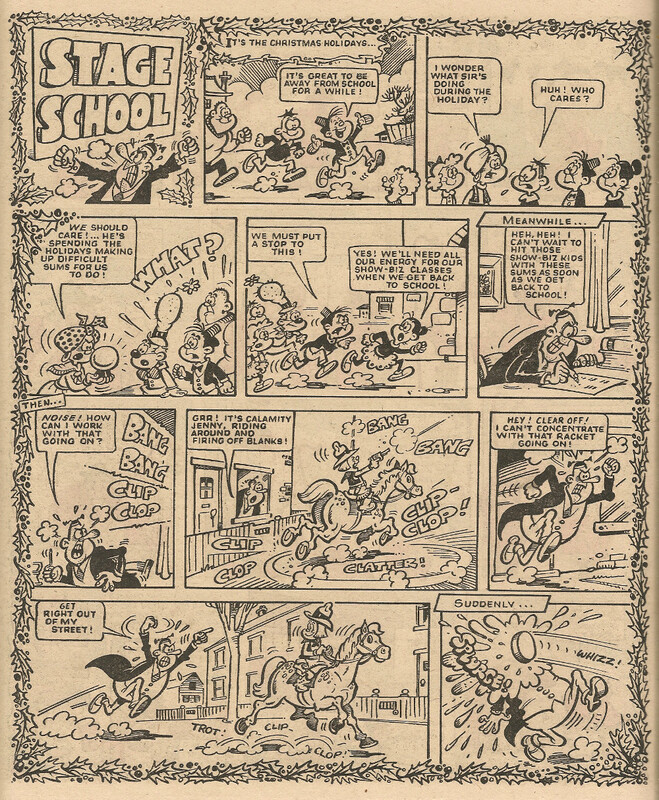 In terms of the characters featured, this ad is somewhat Whoopee!-centric, depicting as it does Sweeny Toddler and Daisy and Billy Bumpkin, all of whom were appearing in that title at the time. 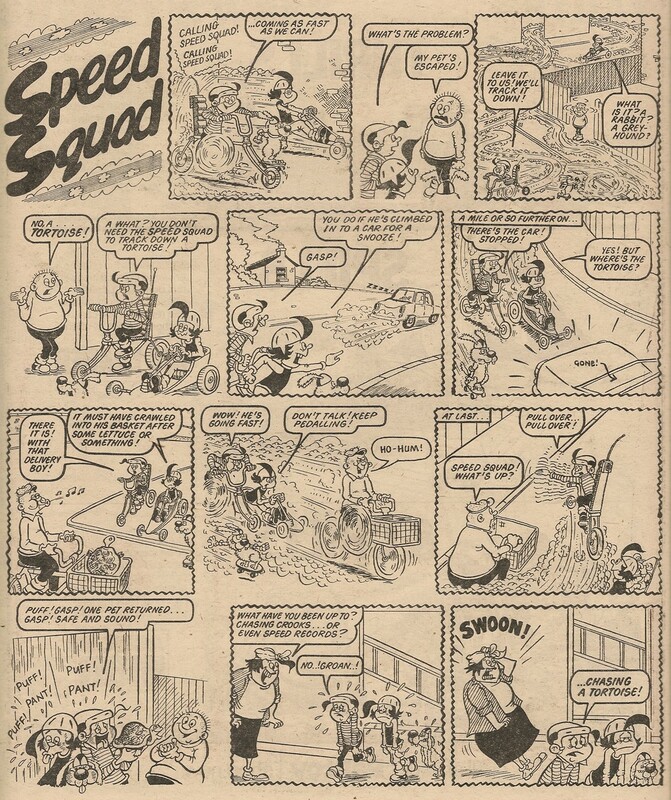 Why no representatives from Whizzer and Chips and Cheeky Weekly? 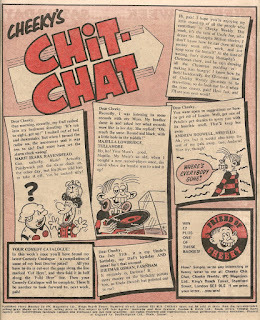 The constituent parts of Cheeky Weekly's Top Ten Poster appeared in the issues dated 7, 14, 21 and 28 April 1979, with the centre pages of each issue devoted to the poster. The parts were published in ascending order of popularity except in the case of the 7th position (Blondie) who were omitted from week 1 but included in the following edition. Accompanying each instalment of the poster, but safely located towards the rear of each issue so that they would survive the extraction of the poster elements, were instructions on assembly, given by the toothy funster himself (along with Snail). Each of these instructions were slightly different to the others, beyond the expected adjustments relating to the part numbers. 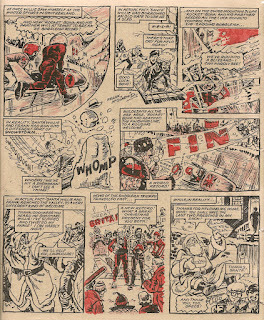 The 21 April 1979 instructions refer to the 'colour poster' which, although the pages featured coloured borders and text boxes, is not really an accurate description of the contents. 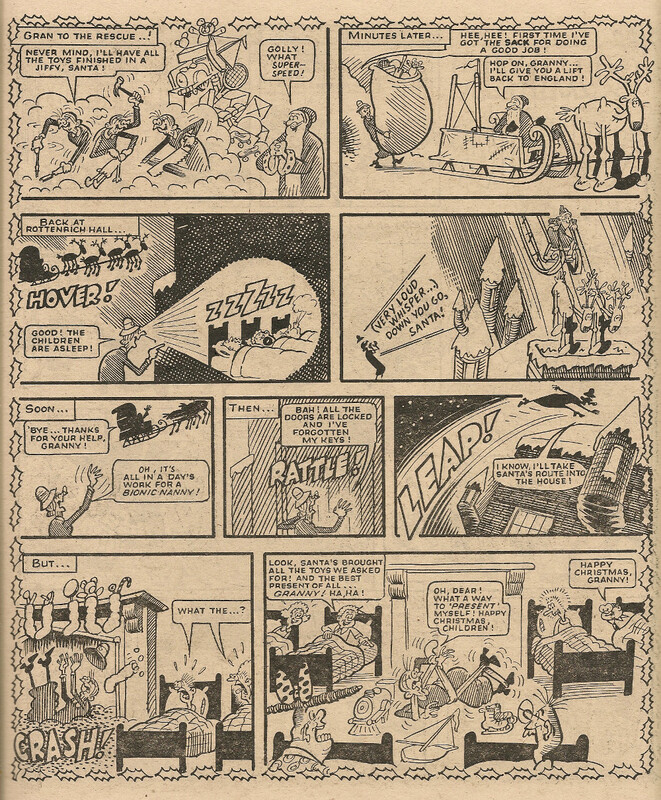 multi-comic promotion the following week, this time including Buster and Monster Fun. 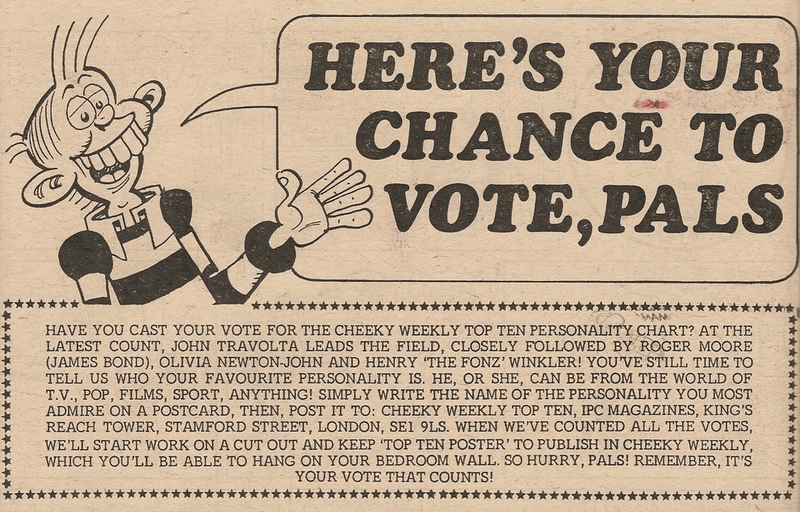 With the final part, the poster now styles itself The Cheeky Weekly Personality Poster despite the previous references to the Top Ten Poster. 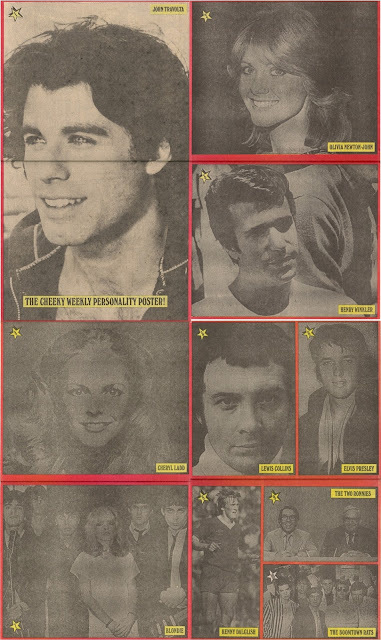 Sadly, due to the limitations of the somewhat basic printing process and the poor quality paper, all the celebrities, with the exception of John Travolta for some reason, seem to be peering out through a thick fog (I'm surprised Kenny Dalglish's match wasn't postponed, and The Two Ronnie's TV studio wasn't evacuated on the instructions of the fire marshal). I doubt whether this dull, depressing poster stayed on many bedroom walls for long. But the big question is what happened to Roger Moore? From being placed at number 2 in the 27 January 1979 comic, he has completely disappeared from the rankings. 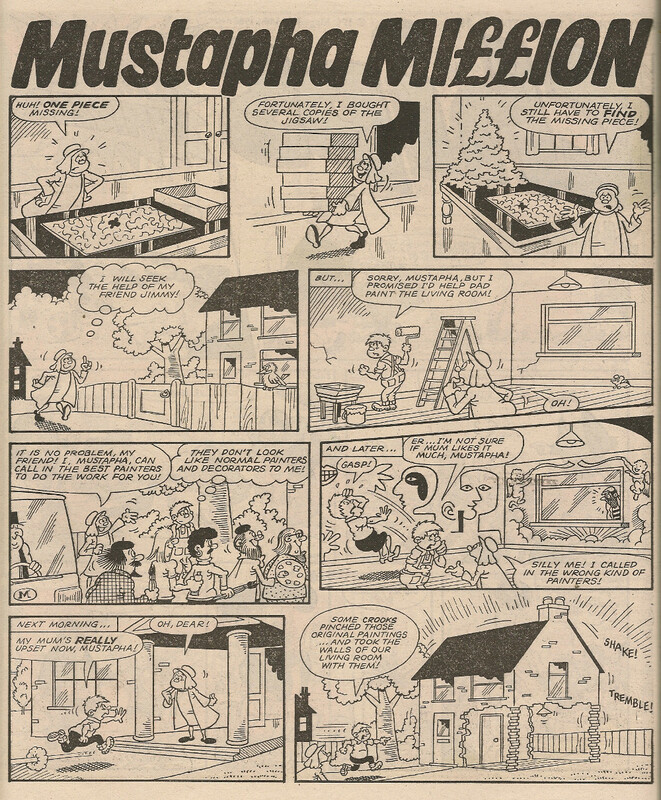 07 April 1979 - Tease Break puzzle filler and another appearance of the above 'Comics Go Pop' ad, & First page of Mustapha Million's 2-page adventure. 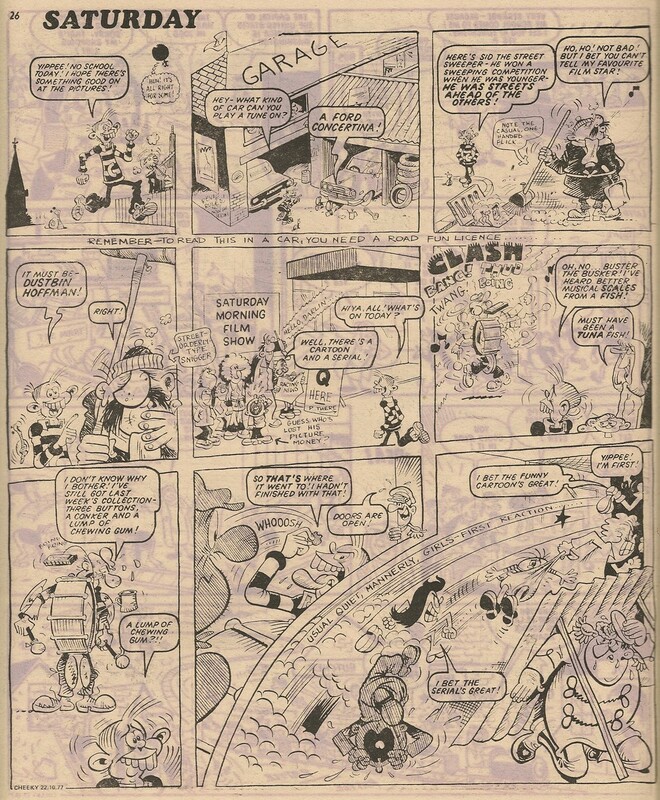 14 April 1979 - Ads for Tornado, and Buster and Monster Fun Spring Special, & Disaster Des. 21 April 1979 - Ads for Tornado, and Cor!! Holiday Special, & Why, Dad, Why? 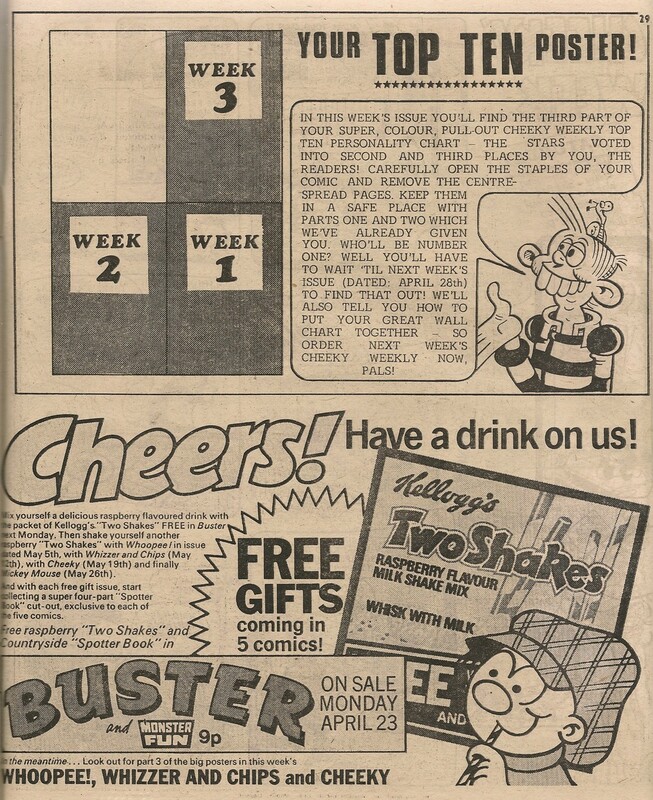 28 April 1979 - Ads for Jackpot (first issue) and Buster and Monster Fun Spring Special, & full-page ad for the Milkshake promotion shown above.